A tow-tier birthday cake for twin girls birthday. Pearl baby pink fondant cover with girly cake toppers for a very special celebration. 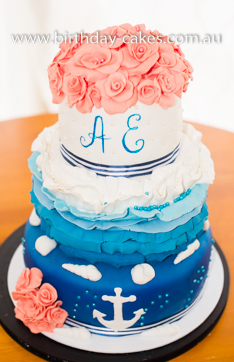 A three tiers marine themed wedding cake with marshmallow fondant decorations. 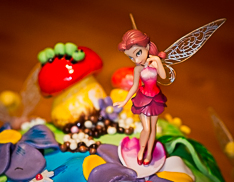 A colourful and simple birthday cake for girls for a fairies themed birthday party. I talk about using some handy tips for making this type of birthday cakes and saving heaps of time by using pre-made decorations. 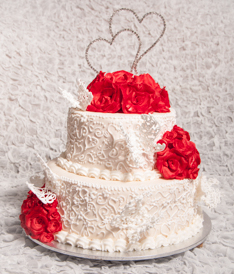 A two tiered wedding cake decorated with white chocolate and marshmallow fondant roses. Made to decorate a beautiful wedding table and later served as a yummy sweet dessert. 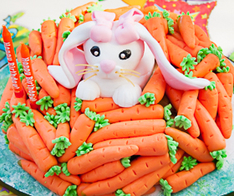 Cute and very colouful, this bunny and carrots cake brought lots of smiles and joy for the little girl's second birthday party. 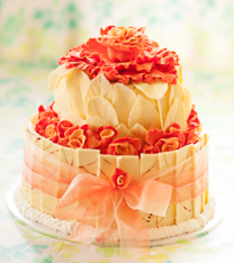 Hope it will inspire you in some way for your cake creations. A fun and colorful birthday cake for a mermaid themed party. 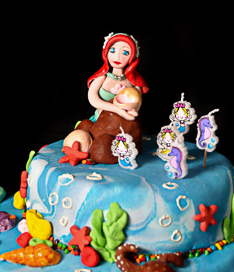 It has a mermaid and all kinds of ocean themed edible decorations. 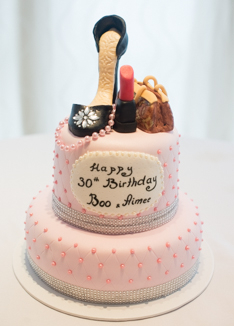 A simple and elegant way to make a fashionable shoe box birthday cake for someone very special to you. 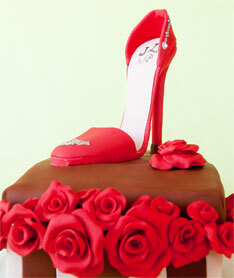 It makes it stand out if you add some edible flower decorations and a shoe cake decoration on top. A pretty and simple baby gift with a loving touch. A great way to gift simple things as a baby present to be used after. It will make any mum smile. A beautiful two-tiered chocolate wedding cake with marshmallow fondant roses and royal icing butterflies. I was happy to make and decorate this wedding cake to become a part of this special celebration. 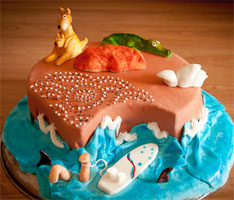 A fun and colourful Australia Day Cake. It is shaped like Australia and has all popular things about Australia. A special themed cake for a special day in Ozz. 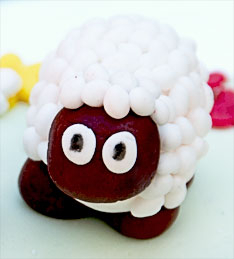 Colourful, fun and so loved by kids farm animals cake decorations. They are made from marshmallow fondant. Such farm themed edible cake decorations will make any kids birthday cake or cupcakes very special and exciting for kids. 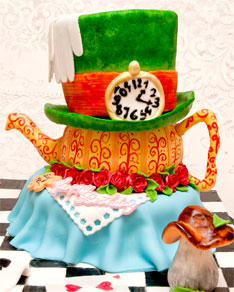 A colouful three tier Alice in Wonderland Birthday cake for girls. It is chocolate inside and very colourful and bright outside. Was very delicious and just loved by kids. I'm glad to share this basic chocolate cake recipe. 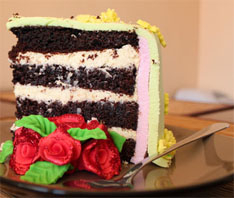 It will be a perfect cake recipe for any kids birthday party and any party for chocolate cake lovers. 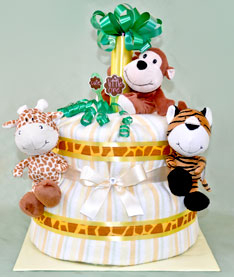 A simple but cheerful jungle themed nappy cake. It has neutral colours to make a perfect gift for a baby boy as well as a baby girl. The colours and decorations are very nice for a baby gift or a baby shower gift. A dinosaur birthday cake for kids. 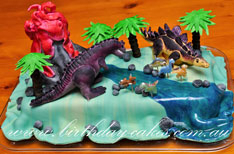 It is a chocolate mud cake inside and a dinosaur world outside created with sweet marshmallow fondant decorations and beautiful dinosaur themed birthday candles as a fun and bright finishing touch to this dinosaur themed birthday cake for kids. 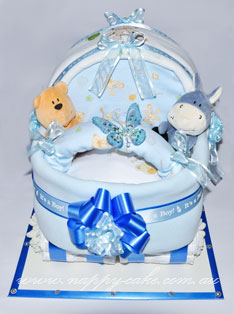 This is a blue baby boy pram nappy cake made with love and care to become a baby shower gift. It is made of baby nappies, baby blankets and baby wrappers in the shape of a baby pram with beautiful decorations and cute little details. 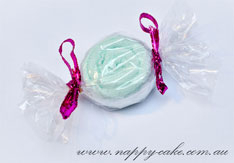 Here you will find photo instructions about how to make baby shower washcloth lollipops. They are easy to follow and will help you to make your own perfect baby shower lollies to become a very special baby shower gift or a baby gift. 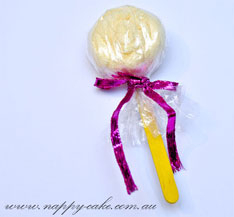 Here you can find some easy instructions on how to make baby shower washcloth lollies. They are often used as baby shower decorations, baby shower favors or nappy cake decorations. 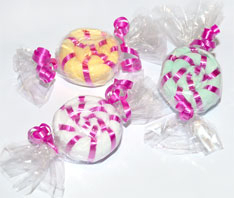 Baby shower lollies are easy to make and so much fun to use and decorate with. This is a unique and colourful baby shower nappy cake gift. 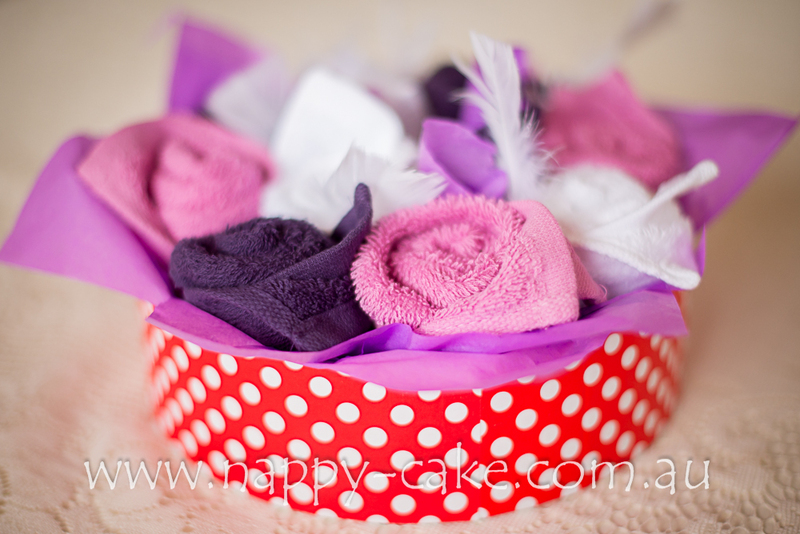 It contains nappies and baby washcloth packed in a pretty polka dot round gift box. 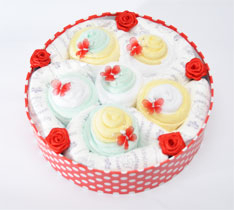 It is a beautiful baby shower gift ready to go and make someone feel very special. A flower pot nappy cake. 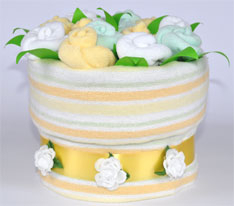 It is a nice flower themed nappy cake for a baby boy or a baby girl. It has only neutral colours and will always be a perfect baby gift, especially in cases where it is not know if it is a boy or a girl coming soon. This is a very easy royal icing photo recipe. 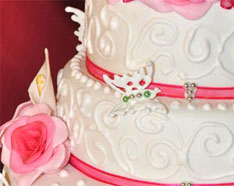 Royal icing is used for cake decorating and making all kinds of sugar decorations for cakes. Royal icing is also used to decorate cookies, gingerbread houses, candies and many other sweet treat to make them look extra special. Although it is very sweet, normally it is used just for finishing touches but not that much for eating. Here are some cute little washcloth baby shower lollies which are so easy to make and so nice to use as a baby shower gift or a newborn baby gift. They are so much fun and will always be accepted with a smile as a baby shower prize or favour idea. They will also make the best baby shower table decoration. This is a unique bike nappy cake for twin girls on the way. It made a perfect baby shower gift and put a lot of smiles of everybody’s faces. 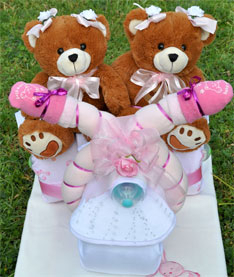 Two cute teddy bears sitting on a pink and white bike made of lovely baby products, such as nappies, baby wrappers, baby blankets, baby bottles and more, altogether made a lovely baby shower centrepiece. These are small size kids birthday cupcakes, covered and decorated with marshmallow fondant. They are very sweet and are also of a very good size for the little ones’ hands. 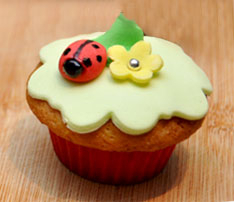 These birthday cupcakes are decorated with ladybugs, fondant leaves and flowers and would be a perfect birthday dessert for a boy’s or girl’s birthday party. 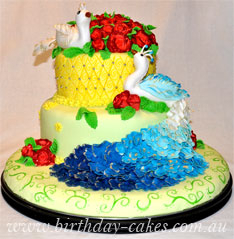 This peacock birthday cake is decorated with fondant peacocks and lots of beautiful fondant rosess to create a loving and romantic look. The idea was to show love and romance of these beautiful birds.